On my list of things to do in 2011, #8 was "buy art for the house". I just bought a slew of these awesome prints on Etsy. The shop has a buy three get one free special. 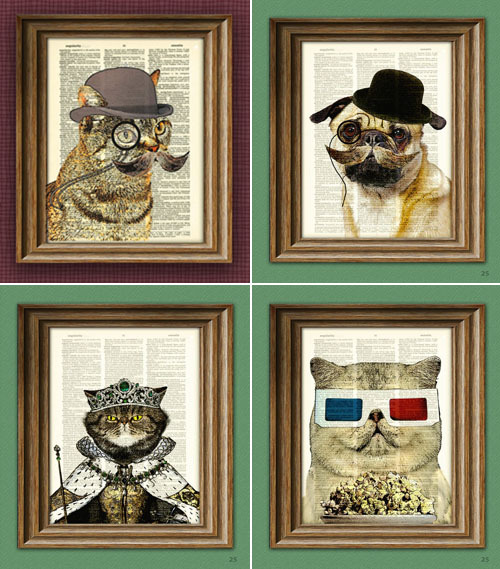 They are hilarious - animals dressed up fancy - printed on dictionary pages. The one in the upper left corner is called "Dandy Cat". I love that they used upcycled dictionary pages. I am pretty sure they pick pages with words that match the illustration. I can't wait to frame them. I got some of these for people for Christmas gifts and they loved them! Such a great concept!